The 7th Annual Fall Tiger Beetle Trip™ is officially over – Chris and I rolled back into town a little after midnight last night. It was an amazing trip – perfect weather, unparalleled scenery, and a record-breaking 16 species of tiger beetles seen in 13 localities across four states. Not only does this beat my previous trip record of 13 species, but we did it with only five days in the field. At the time of my previous update, we had visited several locations in the South Dakota Badlands and Nebraska Pine Ridge and found ten different tiger beetle species, including Cicindela pulchra (beautiful tiger beetle) – our top priority for the trip – C. nebraskana (prairie long-lipped tiger beetle), and C. lengi (blowout tiger beetle). Our plan for the next day was to visit the Badlands of Wyoming to look for C. decemnotata (Badlands tiger beetle – appropriately) and the Yampa River Valley of northwestern Colorado to look for C. scutellaris yampae and C. formosa gibsoni, all three of which we managed to find (though with caveats – stay tuned). Our originally planned final field day was to take us back into Wyoming to look for C. longilabris (boreal long-lipped tiger beetle) in the mountains east of Laramie and the Nebraska Sand Hills to look for the delicate little C. limbata before heading back home. However, we were finally paid a visit by “the skunk” and did not see any of these species (although our sighting of C. limbata (common claybank tiger beetle) in Wyoming did officially break the old trip record). Not wanting to end the trip on a disappointing day, we delayed our departure for home yesterday and visited two more sites at the eastern edge of the Nebraska Sand Hills (sites M and N in the above map) – a clay bank site where we saw a robust population of C. denverensis (to augment the single individual we had seen earlier in the trip) and several C. splendida (splendid tiger beetle), and another sand dune/blowout system where we at last succeeded in finding C. limbata. The day after the end of the Annual Fall Tiger Beetle Trip™ is usually a somewhat depressing day for me. Not only is the trip over, but likely so is the entire insect collecting season. I know I need the down time to process the specimens and knowledge acquired during the season, but the field work itself remains my favorite aspect of this pursuit. Nevertheless, the experiences from this trip will fuel my memories for years to come, and in the next weeks I’ll share some of the stories that unfolded. Until then, I leave you with this portrait of C. pulchra – looking rather annoyed with me for my persistent efforts to take his photograph. This entry was posted in Cicindelidae, Coleoptera and tagged beetles, collecting trip, Colorado, entomology, Great Plains, insects, nature, science, South Dakota, tiger beetles, Wyoming. Bookmark the permalink. 16 Responses to Sweet Sixteen! Hi Ted, and welcome back! Sixteen, exceeding expectation — That’s great. Thank you, James – and thanks for the awesome post while I was away. Welcome home Ted! Your TB has a bad case of bed head! Ted, you’re always welcome here in the Sulphur Springs Valley where we are fortunate to have 18-20 species and subspecies of tiger beetles including Amblycheila and the Willcox Playa endemics. In addition, some of the adjacent “sky islands” support several disjunct populations and color variations. Good show Ted. I managed 14 species in NW Colorado, western Oklahoma, and the sand hills of Nebr. on my early June trip there in 2007. I added two more in Utah on the way back to northern California. If I had known about the little C. celeripes in Okla. might have added that one to the list as I was within a mile or two of the site you have mentioned in a previous post. I was at the Cimarron River south of the town of Freedom. Great tiger beetle country, indeed! I’ve become quite enamored with the Great Plains precisely because of its tiger beetle fauna. Speaking of C. celeripes, I’m almost finished with a manuscript that will report my recent observations on this species and discuss its potential conservation status in the context of its historical occurrence. I’m more optimistic about the long-term prospects for this species than I was before I found it in Oklahoma, but I don’t think it’s out of the woods just yet. Sounds like you had a fabulous trip, Ted! I’m looking forward to the future posts telling us all about it. I’ve been taking weekend trips lately, and just returned from Salt Plains NWR in northern Oklahoma. 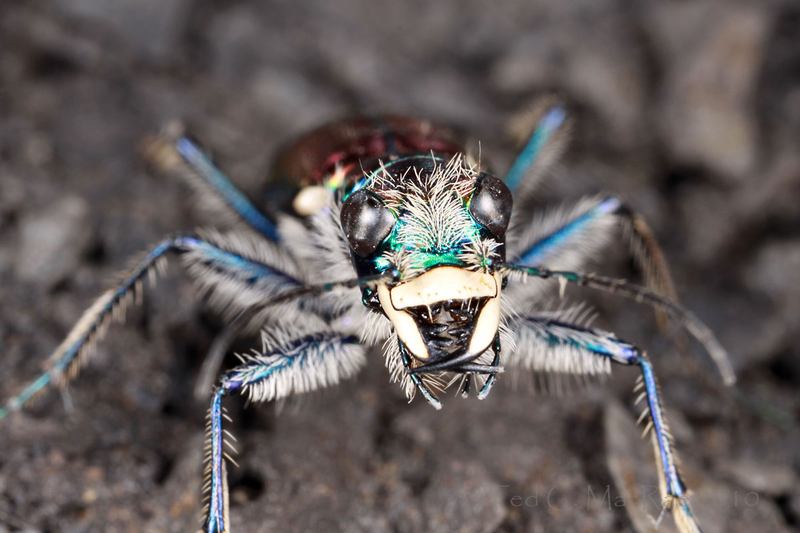 I saw three species of tiger beetle and got photos of two of them. I’ll figure out what species they are (probably from your site! ), and write them up for AIF. Woohoo! Good job – that’s a great site! I have eight species of tiger beetles recorded from there so far from one summer and two fall visits. I’d like to get there during spring and see if I can find another species or two. Thanks, TGIQ – it really was one of the best ever (my only complaint being the much too short 5 days in the field). Collecting for diversity is a blast. You never know exactly what you’ll get, and in between common species you find awesome rare gems. The awesome thing about this trip was that we found all but one of the “A-list” species that we hoped to see. None of them were a shoe-in (that’s why they were A-list species! ), and two of them (the two Colorado species) were impulsive, last-minute additions after the trip was already in progress. The experiences that go along with finding these things are the best!